Once, America was an energy powerhouse. Coal, oil, natural gas, hydroelectric power, and later, nuclear power generation brought reasonably priced energy to our people, spurring a lasting economic pace that reshaped and bettered the whole world. Then the Leftists emerged and systematically attacked all parts of the system and America’s energy resources were, one by one, made unnecessarily costly and difficult to bring to we, the People. 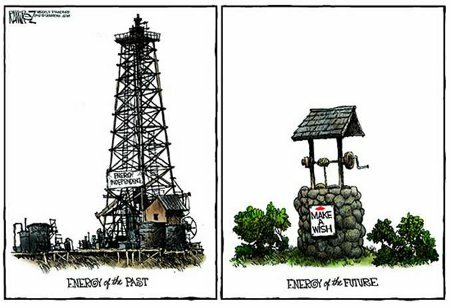 And just what do these jabbering Leftists have to replace America’s tried and true means of energy production? To-date all they have are drug-fueled fantasies and delusions stemming from the cognitive inability to differentiate between science-fiction and science-fact. This is fact. Wind, solar, and geothermal power, along with the various alternative fuels are not ready for the market and none of them can survive as commercial concerns on their own merits. In many cases even extreme levels of government subsidies and tax breaks aren’t enough to ensure their commercial viability. Additionally, many of these means of harnessing energy by non-standard means have negative consequences that haven’t been nearly well enough researched or mitigated as of yet. Of course, the Leftists, especially the Eco-Left elements, don’t care about that. If anything, they view these failings as positive things since their agenda is more about destroying America as it is and rebuilding it as something fundamentally different than about solving for America’s energy issues. Global Sustainability requires the deliberate quest of poverty, reduced resource consumption and set levels of mortality control. That’s a large part of why they rejected Energy Independence in favor of Global Warming as a platform to work with in order to reach their goals. Their goals had and continue to have little or nothing to do with solving the energy / fuel situation. NOTE: None of the above should be construed as my saying that new forms of energy production shouldn’t be researched or that our government shouldn’t help fund that research. I’m completely in favor of both research and government help with funding that research. This entry was posted on Saturday, October 13th, 2012 at 3:42 pm and is filed under Politics, Society, Technology. You can leave a response, or trackback from your own site.